We’ve talked to Lennie a fair amount lately about the impending baby, and we’ve asked her at different times whether she thinks we’re having a girl or a boy. A month or two ago, she insisted that it was to be a boy, but she’s more recently changed her tune and generally says she thinks it’s a girl. We got an ultrasound the other day and asked the tech not to tell us what we were having. M has a hunch, though, as she saw something on the video while I apparently looked away or zoned out. Pretty soon, I guess we’ll divulge our suspicion. In the mean time, Lennie has volunteered that the baby’s name is Simba. The name applies to a male character within my generation’s pop culture, but it’s got a feminine ending (at least in Romance languages), so it’s sufficiently androgynous as a placeholder for now. So without further ado, I introduce you in the picture link to Baby Simba. 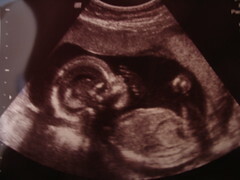 Click for a few more ultrasound stills (sorry, no money shot).